Matterhorn and Dent d’Hérens on the border between Switzerland and Italy. Ambassador H. E. Lukas Handschin, working for Grün Stadt Zürich, the city of Zurich’s Office of Parks and Open Spaces. A total of 17 Swiss people were living in Lithuania by the end of the year 2012. Out of the actually 1.864.699 foreigners living in Switzerland [by August 2013] approximately 1000 are Lithuanians. Switzerland is a mountainous, landlocked country in Central Europe. Officially it is named Swiss Confederation (Latin: Confoederatio Helvetica, hence the abbreviation CH). You may have noticed this somehow strange country symbol on a sticker placed next to the number plate of cars. Get some useful travel information. As a federal parliamentary republic Switzerland is currently consisting of 26 independent cantons, with no capital town. Bern, often considered to be the capital of Switzerland even by Swiss native people, is only the seat of the federal authorities and some – but by no means all – of the federal offices and institutions. Switzerland has four official national languages, German, French, Italian, and Romansh (Rhaeto-Romanic), and a great variety of local dialects which may give you a hint about the manifold cultural regions and traditions. The Swiss, therefore, do not form a nation in the sense of a common ethnic or linguistic identity. The strong sense of belonging to the country is founded on the common historical background and shared values like federalism, direct democracy, independence, and neutrality. The establishment of the Swiss Confederation is traditionally dated to early August 1291 when a Letter of Alliance (or Federal Charter) was signed [there is no precise date given], documenting the Eternal League of the Three Forest Cantons, the union of three cantons (Uri, Schwyz, Unterwalden) forming the nucleus of the country in what is now part of central Switzerland. Hence Swiss National Day is celebrated on 1 August. Switzerland is famous for its public transportation system, the federal railways as well as many others privately or publicly run companies. Have a look at this tv-spot. Hereinafter you will find some examples of cultural ties between Switzerland and Lithuania in general, Vilnius and Užupis in particular. Troughout the centuries the beauty of Swiss landscapes inspired many artists from all over Europe. 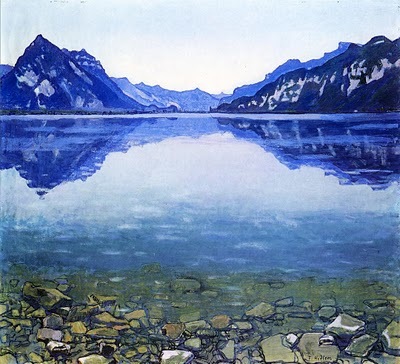 Ferdinand Hodler, Thunersee von Leissigen aus. Switzerland did not only inspire painters but also quite a lot of Lithuanian authors and poets, among them e.g. Maironis at the beginning of the 20th century. 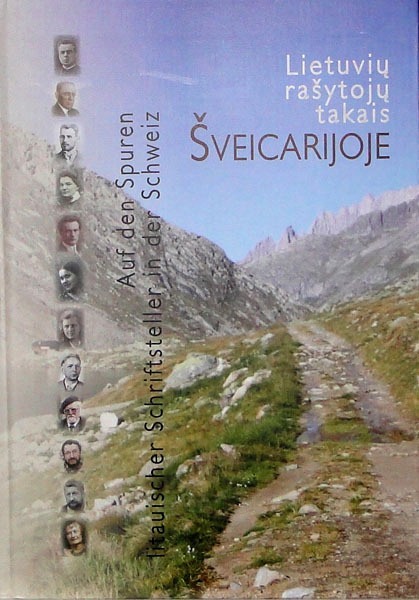 This book which is leading you to the trails of Lithuanian authors in Switzerland was published in a bilingual Lithuanian-German edition in 2009 by Šveicarijos lietuvių bendruomenė. On the trails of Lithuanian authors in Switzerland. On May 24, 2018 H.E. 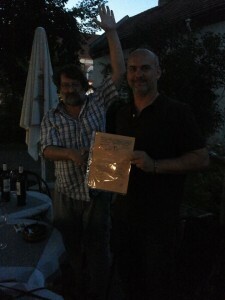 A.Slavuckij will be honoured with the highest award of Uzhupis Foreign Affairs – the order of the Silver Garlic bullet. 24 мая 2018 г. Его Превосходительству А. Славуцкому будет вручена высшая награда МинИнДел Ужуписа, орден Пули Серебряного чеснока. The territory of Crimea was conquered and controlled many times throughout its history. The Cimmerians, Greeks, Scythians, Goths, Huns, Bulgars, Khazars, the state of Kievan Rus’, Byzantine Greeks, Kipchaks, Ottoman Turks, Golden Horde Tatars and the Mongols all controlled Crimea in its earlier history. In the 13th century, it was partly controlled by the Venetians and by the Genovese; they were followed by the Crimean Khanate and the Ottoman Empire in the 15th to 18th centuries, the Russian Empire in the 18th to 20th centuries, Germany during World War II and the Russian Soviet Federative Socialist Republic and later the Ukrainian Soviet Socialist Republic, within the Soviet Union during the rest of the 20th century. Everybody has several identities that may vary in intensity in different contexts and interactions. Among others, we can detect sexual, gender, marital, familial, kinship, national, ethnic, religious, occupational, recreational and virtual identities. Such identities are recognized individually and socially. Parts of them remain hidden and unconscious; parts of them are revealed and conscious. We also identify with different groups (“in-groups”) and exclude other groups (“out-groups”). By accepting something “beyond” your own identity, group, religion, nationality, city, country or life style, you may become dislocated into some other vista of imagination, into an imaginary community and a mindscape that escapes predetermined modes and formulae. In such a mindscape, the guarded history of “our” security zone may lose its grip and turn out to become unexpected futures of imagination, created by imaginary conversations. They do not need any definite place and time; they can be started at any moment and at any place, between strangers. There are strangers not only outside but also inside ourselves. Monologue can expand to dialogue that can further be widened to polylogue. Imaginary land-/mindscapes have no permanent identity. They are multirealizable and multimediumizable in different forms, colours, shades, sentences, sounds, mobiles and installations. “Beyond” clear-cut definitions, the realms of chance will open, facing possibilities that cannot be owned or mastered. Memories are neither permanently stored but storied transiently, cross the borders, over the flow, to be remembered anew, meditated and dreamt by desirous-spiritual human beings. Knots and dilemmas belong to human existence. Over and over again we have to remind our fellow beings, “Don’t yell at me, and yell at me, from beyond, so that we can hear from each other.” The dialogue begins only when we open our ears. The fear of the different is the beginning of the diagnosis and elimination of the dissentient. A child learns languages on the basis of palimpsests and babbles. By echoing and mirroring, a child grows toward one’s ever-changing “own” language which is full of the expressions of the others. Identity, self, language and memory are constructed by a heavy dose of echolalias. What I am about to say as “my truth” is already lost in saying, evaporating in the interference of flows. Meanings never hold their positions in a workshop of playful surplus meaning making. Total control and enforcement are lost in play, in love for others’ words and lively encounters, which include the nearest and dearest, the strangers and aliens and even some daytime demons. The utopian (no topos) dreams of belonging to some ideal community or communion are developmentally urges that seek the reunification of separated parts, the fusion with all-embracing parental saviour figures. Every ism, also Utopianism, is illusionary and doctrinarian, against reasonable consideration and reality principle. Of course, there are unfruitful fantasies and dreams that ossify and petrify, wearing out to torrid conceptions and isms. Without creative fantasies and dreams, reality would, however, be meagre and unconnected to the well-springs of life. 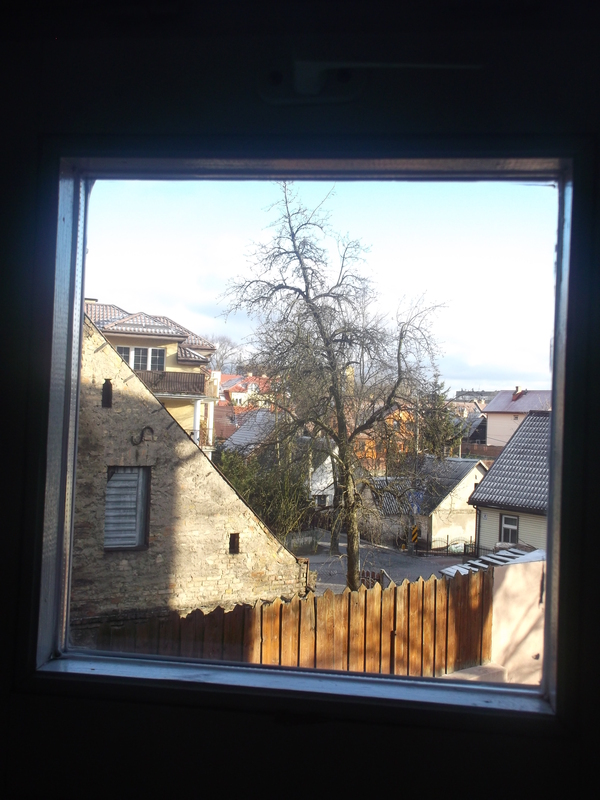 Užupis is not a restricted place but an open space for inner and external transformations. Užupis is not “ours,” not belonging solely to “us,” to “our” group or pals. It is for the nomadic seekers of changing truths; it is for the wise and for the ship of fools. Its mother tongue is polylogical and multilingual, constituted on the edge of emergence of joy, surprise, and terrific apparitions. Not even the “beyond” will save “us.” However, we can save our transient selves by going on living, not like predetermined and manipulated compulsively buying supermarket consumer zombies, but by expressing, as well and carefully as we can, our loves, hopes, fears and anxieties in relation to our nearest and for those who are “beyond” our horizons and perspectives of understanding. A widening of identifications to ever-larger groupings can be detected in human history, in addition to identifications to “individual life styles.” The nation state has been tried to change gradually into supranational organizations. This move had its start after World War I with the League of Nations, was followed after World War II by the United Nations, and is strongly present in our century in the European Union, in the military-political international coalitions in the “war against terrorism,” and in the global business, stock market and environmental regulatory circuits. As an evolutionary coping strategy against the existential problems of helplessness, separation, estrangement, loneliness and loss, the formation of “in-grouping” is aimed at curing such problems, leading at the same time to splits (“us” – “them,” the “winners” – the “losers,” the “good” ones – the “bad” ones) and conflicts that are enacted in enemy chase, warfare and battles over natural resources. When multiple national identities, memories and anticipations interact with each other, as they do in Užupis, for example, there will be interferences and transferences, producing multi-, inter- and crossnational subjectivities and positionalities, both reflexive and relational selves. The multiple cultural scene enfolds in transdisciplinary and transart experiential and experimental explorations. Mono- and normopathic EU sanctions and regulations will not nourish universal and global otherhood which acts as the carrier of multiple meanings and imaginations. The EU will not be life-affirmative if it does not accept any disorder, chaos or deviance from the norms, standards and restrictions. There have to be UŽ-like pockets of euphoria (carrying over of joy) and lazy dysphoria (low moods relaxing of achievement obligations) in the EU. Without them there is no fresh air for breathing, no transitional phenomena. The dynamic formation, deformation and reformation entail fluctuations between rigidly uniform and richly varying states. This dynamics has its dark undertones in loss and threats, but also its exciting challenges hinting at flexible co-operation and fluid co-constructive projects. History is not something external just happening to people. History can be interpreted as a stage or a scene of variations of personal and collective desires, fears, fantasies and dreams. Global world citizens cannot understand their fluid identities and enactments without sensitizing themselves to multiple coexisting identities, realities and enjoyments. The multiverse consists of evolving and revolving stories, the networking of diversified perspectives, aimed at opening up, negotiating and resolving conflicts between loving-hating selves living together with differing historical and futural conceptions and consciousnesses. Stories like identities are never total or perfect. Potential narratives attest to changing times and transitional spaces. We have to let go our cherished final words, key symbols, frozen rituals and sanctified myths. By accepting multidirectionality, there is no return, no revival, and no reunification. While transforming we can refuse being treated as objectified and calculable blocks in a closed matrix and demand our right to the whimsical and empathic meetings of unmanageable and not-totally-knowing minds. There are always gaps in the universal knowledge, as there are more dimensions and spaces than we can dream of. This is not meant to be a motto for anything, not a splitting plea for a “joyful science” or “rebellious art”. It is just an introduction to saying otherwise, to thinking against the official truths, to painting other skies, mixing different horizons and hearing seductive voices.